Bread is something that I really enjoy making. 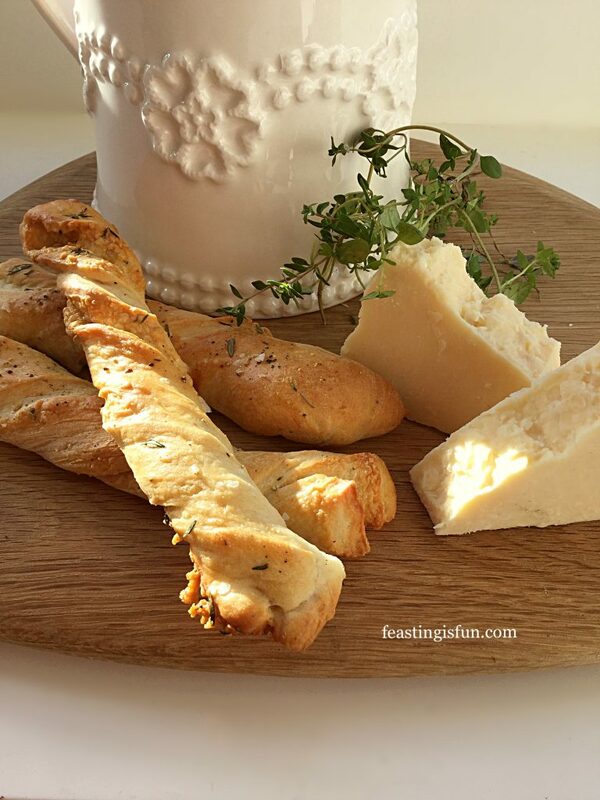 Flour, yeast, salt and water, combined and worked, create a bread with real taste. Add in a few extra flavours and the possibilities are endless. 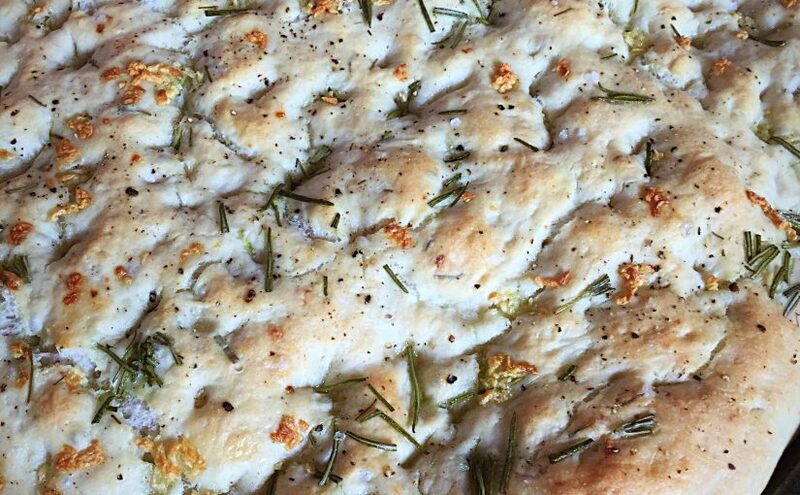 Garlic Rosemary Focaccia Bread is an incredibly easy, yet packed with flavour bread. Perfect for making at home. This week in our house is all about birthdays. Our Lil Man will be 12 this week, it’s also my Sister’s birthday in the same week. Definitely time for Feasting, Celebrating and Fun! Covert baking operations during the day – ready for surprises on their special days. Ooh I love a celebration – well that is as long as I’m not the center of attention! Fortunately, shyness is not something our son could ever be accused of having. His enthusiasm and passion for life is infectious and wonderful to see. He waits all year for his birthday and the night before, without fail, he reaches ‘ready to explode’ status!Christmas is the same for him, times a gazillion!I adore his passion & zest for life, even if at times it can be exhausting and overwhelming. So, to make life a bit easier on myself today, I grabbed a previously, made and frozen Chicken and Four Cheese Lasagne from the freezer last night and left it to defrost in the fridge overnight. Yes, I confess to feeling a tiny little bit smug. 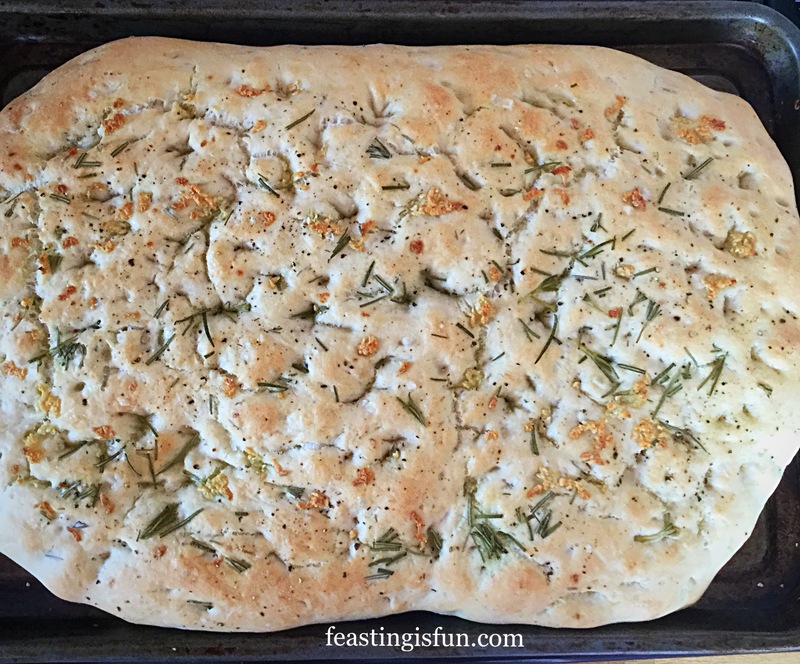 Since I have a bread maker that makes my life (in the world of bread baking), so much easier, I decided to whip up a couple of these GARLIC ROSEMARY FOCACCIA BREAD. 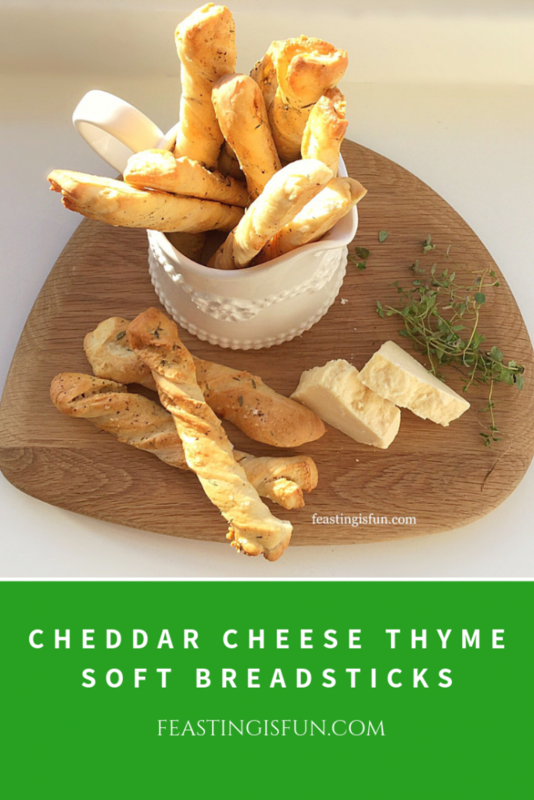 Also, as this is such a reliable and easy recipe, I decided to share it with you. 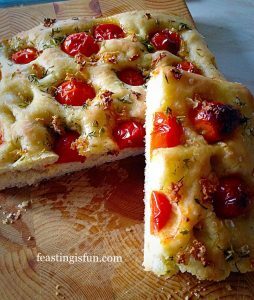 Even with 4 Garlic bulbs added to the bread mixture & the same sprinkled on top, this Focaccia only has a mild Garlic taste. GARLIC ROSEMARY FOCACCIA BREAD: makes 2 loaves. 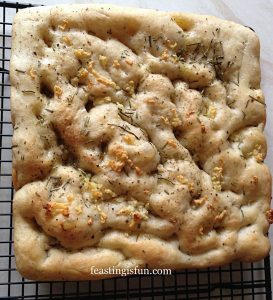 You will need 2 x lightly oiled 8×8″ square tins ( with at least 2″ depth), or – 1 larger oiled baking tray (2″ deep) to bake one large focaccia. 8 Garlic Bulbs (4 for bread mixture, 4 for topping the bread). Place the warm water into the pan or bowl of the device you are using, making sure the dough hook is attached to the stand mixer. Sprinkle over the sachet of dried, activated yeast and swish about with clean fingers to mix. Next place the flour on top of the liquid mixture. Add the oil and salt. Now add 1 tbs of the finely chopped Rosemary and salt. Mince most of the Rosemary finely, allowing a few whole & half leaves to remain so they can be seen in the bread! Add in four minced bulbs of garlic. 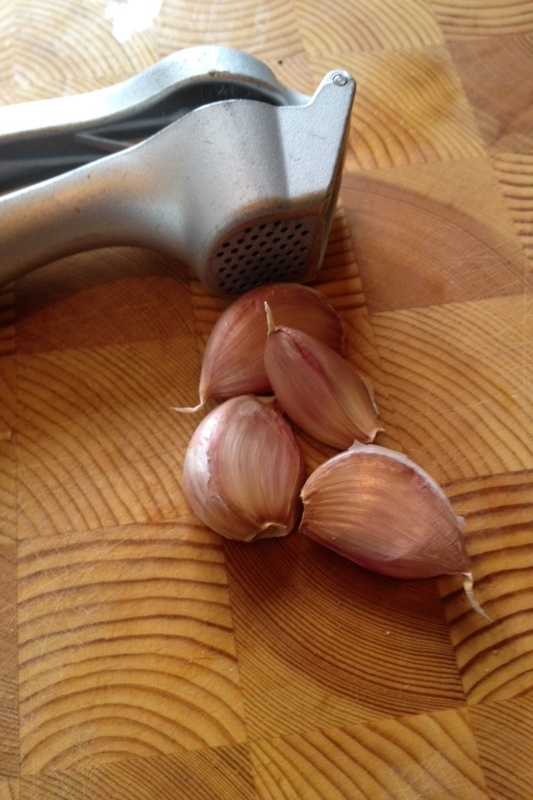 I’m a very big fan of my garlic press (no peeling or chopping), but you may chop, process, squish with the back of your knife. Please don’t write in with other methods for finely mincing garlic, just be happy that you’re innovative. Now mix & prove (if using a bread maker). 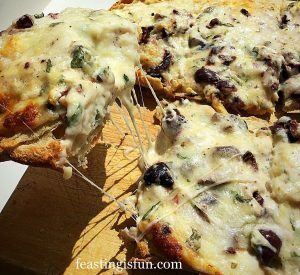 With a stand mixer, attach the dough hook & mix for 8-10 minutes, until the dough has a silky, stretchy, elasticity about it. If kneading by hand, bring all the ingredients together and work (knead) the dough until you can feel the change, when the dough again stretches easily and feels silky to touch – a good way to check that the dough has been worked enough is that it should be hard to tear. 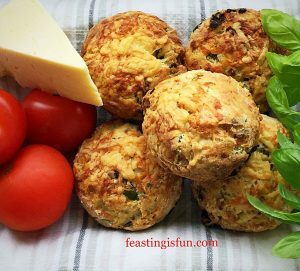 Shape the dough into a ball and place into an oiled bowl, then turn the ball over, so the top has an oily layer & cover tightly with cling film. Place in a warm draught free place until doubled in size (about an hour). 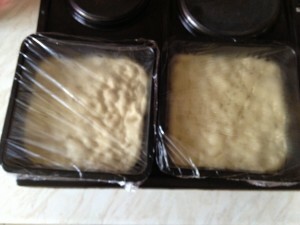 Prepare the baking tins (or large tin if only using one) by placing some oil in the tin (approx 1tsp for a smaller tin). Then using your fingers or a piece of kitchen towel completely cover the inside of the tin with a light slick if oil. When doing this by hand, your nails also benefit from a cuticle treatment. Talking of fingers, if you have long nails it’s probably easier to apply the oil with the kitchen cloth. It also probably means you look after your hands and nails may not need a quick, olive oil cuticle treatment. Just saying, I NEED the treatment. If using a bread machine switch on to knead cycle to knock the dough back for a minute. 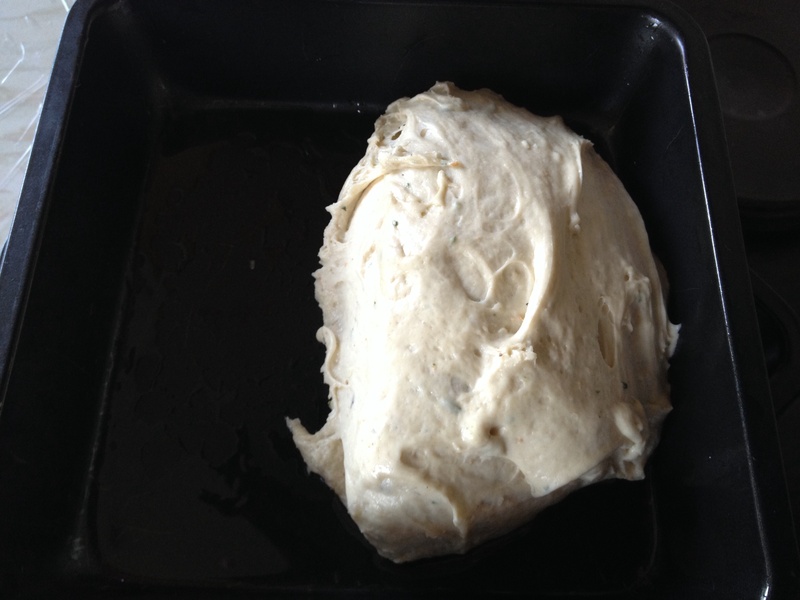 With the dough in the bowl, remove the cling film & gently punch down (enjoy the soft enveloping feeling! 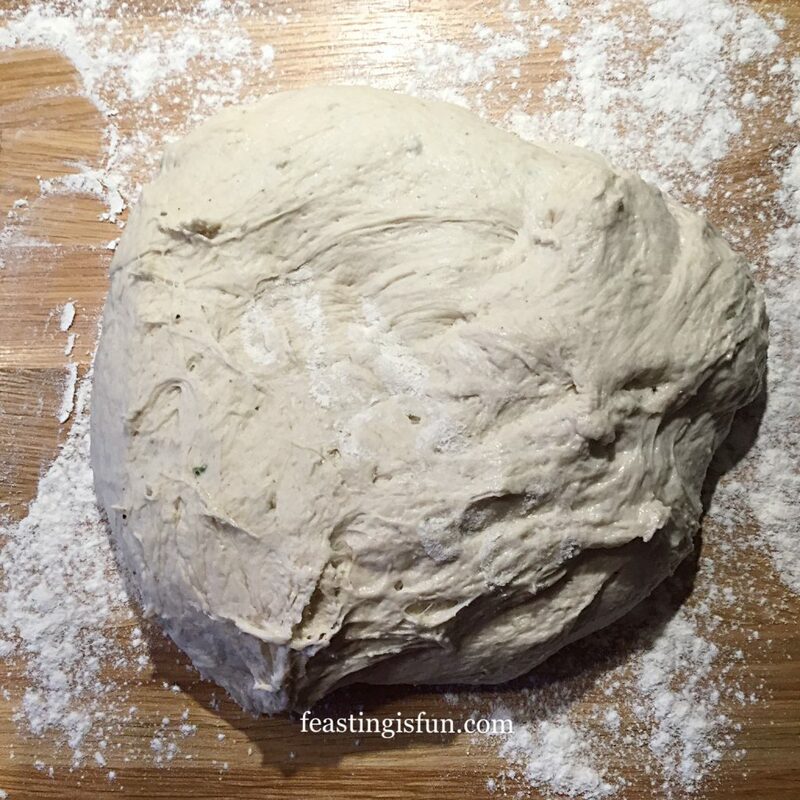 )the dough to knock out the air bubbles and gently knead by hand for 2 minutes. 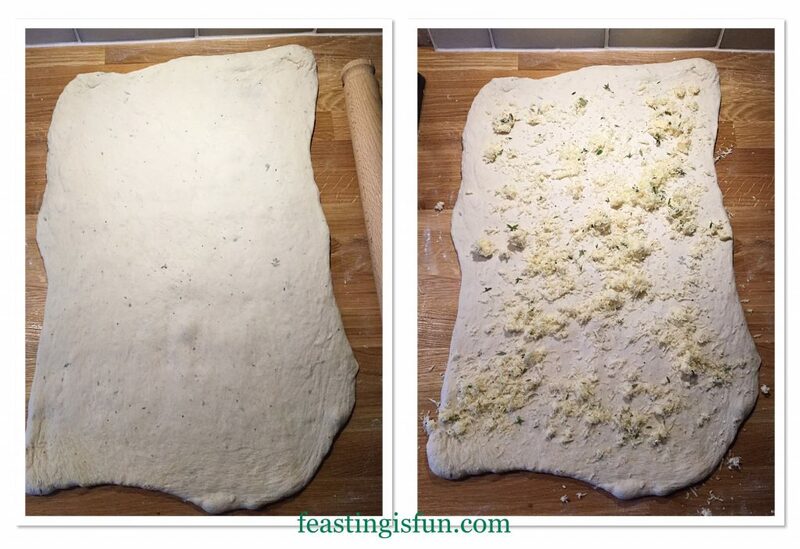 Divide the dough in two (or leave whole if making a larger Focaccia) using a sharp knife or a dough cutter. Place half the dough into each tin (or all into one tin). 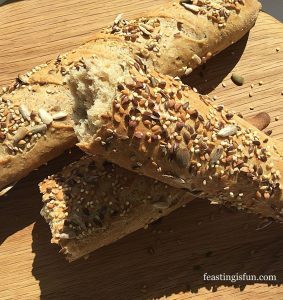 NOW is the absolutely BEST thing about making this type of bread. If you loved making mud pies when you where younger, or maybe still do, you’re going to LOVE this next bit. Using your the heel of your hand, gradually press the dough out until it reaches the edges of the tin and is roughly the same thickness across the tin. 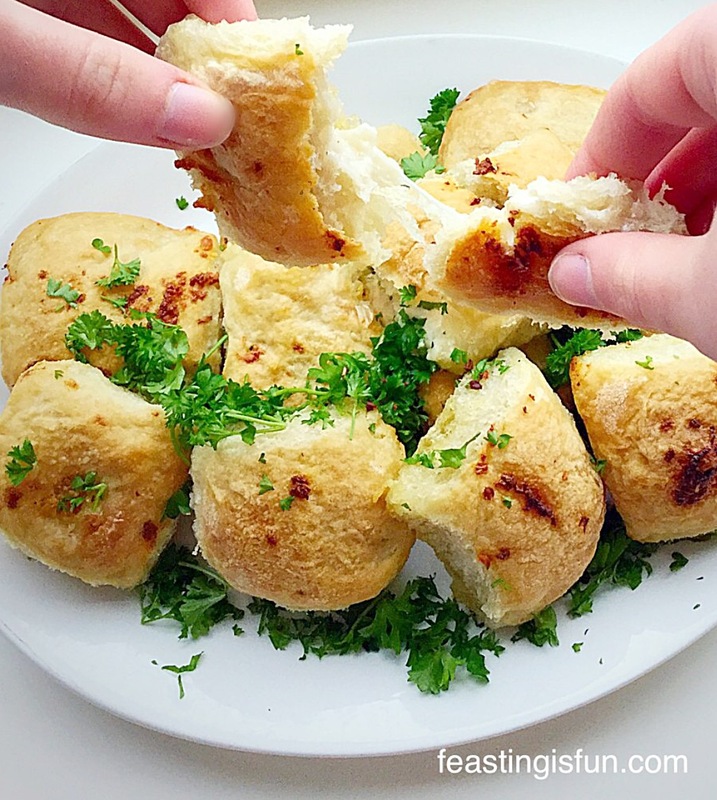 Next using your fingers, have great fun making lots & lots & lots of dimples in the dough – to give it the classic focaccia look. Can you tell how much I really love that part? So much fun! Drizzle a little olive oil, sprinkle some sea salt flakes, the rest of the finely minced Rosemary, a grinding of pepper and the rest of the garlic. 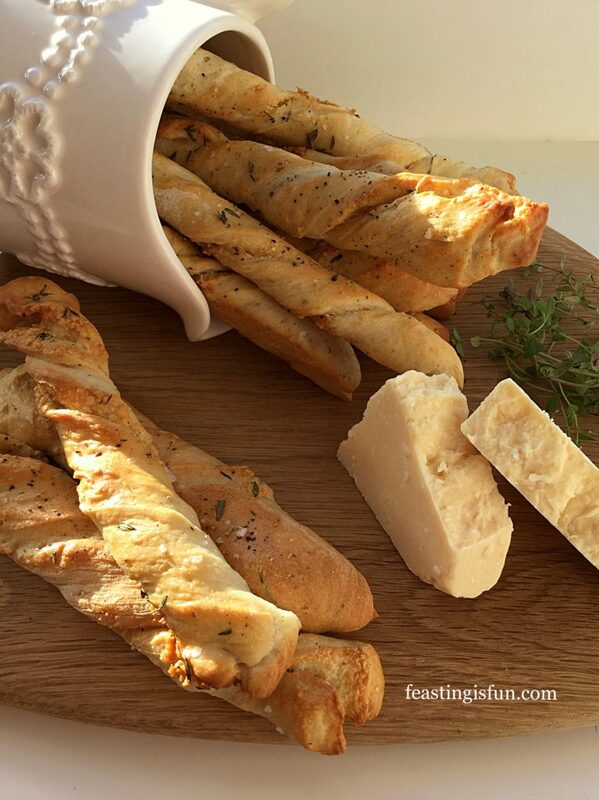 Split over 2 tins if making 2 Focaccia loves. TOP TIP: Using a clean wet cloth wipe some of your work surface so that it is damp. When laying your cling film over the top it will lay flat and not attempt to attach itself to itself, you, or random kitchen objects. 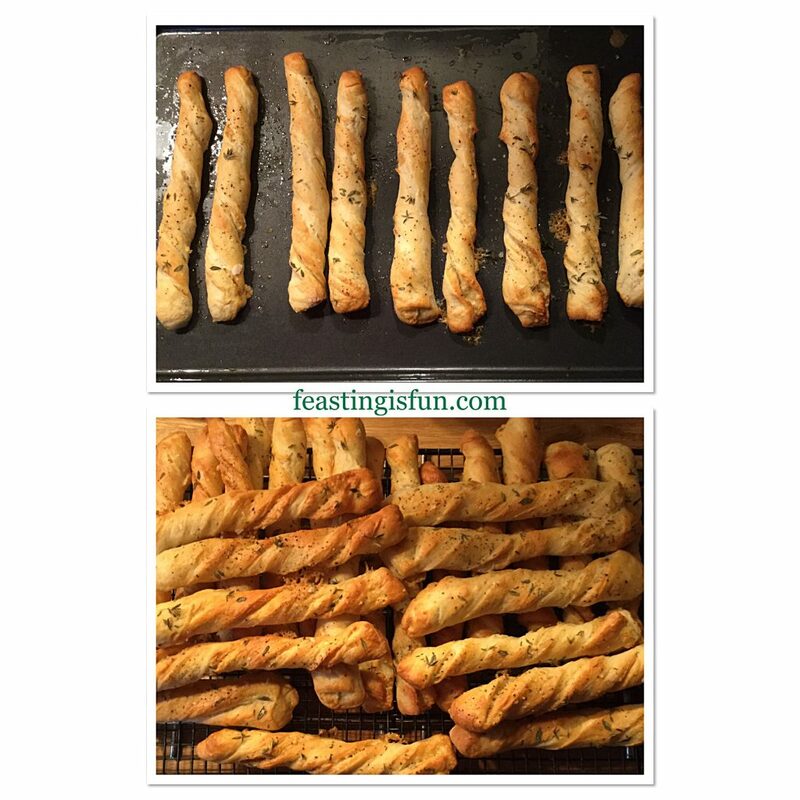 You can then easily spread a light coating of oil over the cling using your hands, or a pastry brush. I know there’s oil in the dough, the tin has been oiled, you’ve just drizzled oil on top of the focaccia – JUST TRUST ME! Most of the time you could get away with not oiling the cling, but and it’s happened to me, it WON’T EVER STICK if you oil the cling! 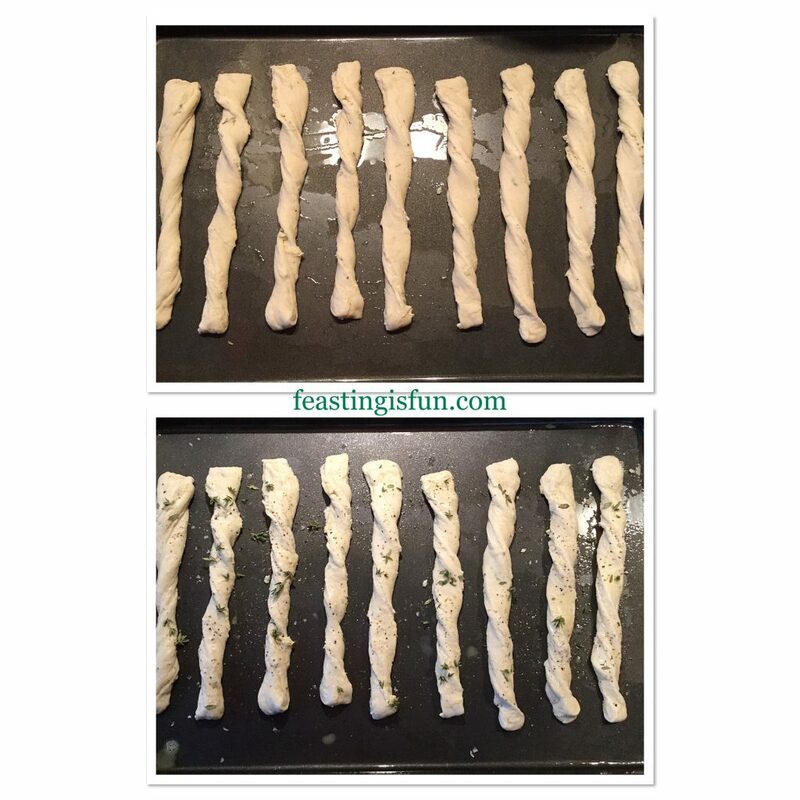 The risen dough does lose some of the dimply effect – so if you want more dimples, repeat the process!!!! Cover the top of the tin with the oiled cling (so it’s airtight) and leave in a warm, draught free place until doubled in size. Alternatively, place the dough in the fridge. While it will take longer to rise, the bread will develop a lovely flavour, due to the slow prove. It’s your dough, so, do whatever you fancy. ANOTHER IMPORTANT TIP – I have successfully risen the dough slowly in the fridge, completely forgotten about it, so it quadruples in size. Knock it back by recreating the dimpled effect, as before, left to rise and it’s turned out fine. Bake the focaccia in a preheated oven for 15 – 20 minutes, until a golden colour and still quite soft. The base should sound hollow when rapped with a knuckle. Once baked, remove from the oven, take a deep breath, the smell is intoxicating. Leave to cool for 10 minutes in the tin, run round the outside with a palette knife until you can feel the loaf easing from the tin. 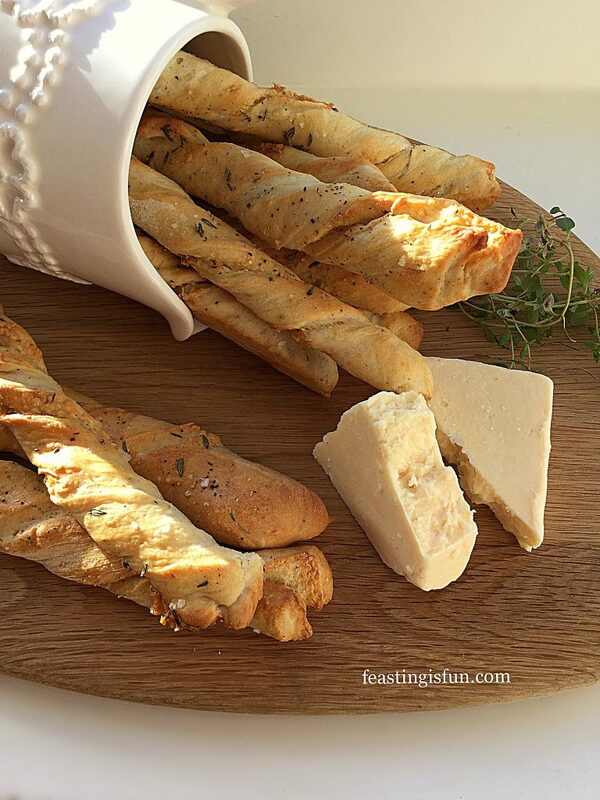 Turn the bread out and place on to a cooling rack. Repeat with second tin. Please dunk me in some scrummy soup, pasta sauce or sausage casserole? 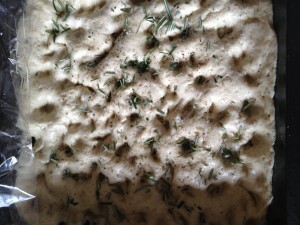 The Garlic Rosemary Focaccia Bread will be marshmallowy soft & is fine to serve warm as is. Or cool, wrap in foil and freeze for up to one month. 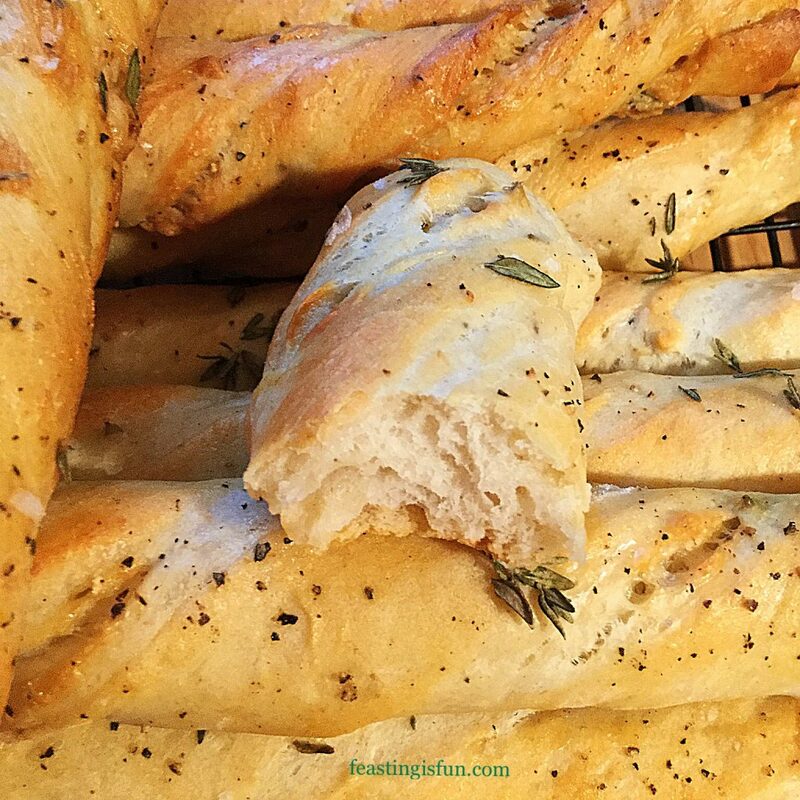 If you prefer a slight crust to your focaccia, 10 mins before serving, place the bread directly on to the rack of a preheated oven (as for baking the dough) for 5 – 10 minutes, depending on how crusty you like it. Because this bread is thinner than a loaf, you can cut or tear the bread whilst still warm. 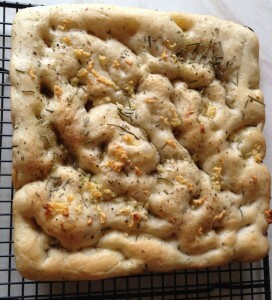 Garlic Rosemary Focaccia Bread baked as a whole. 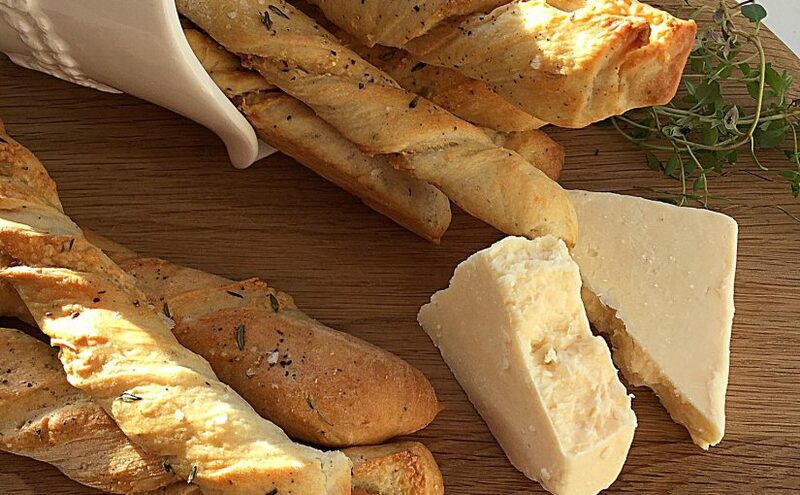 This bread goes with any dish you would normally serve garlic bread with. It also goes fantastically well with soup. 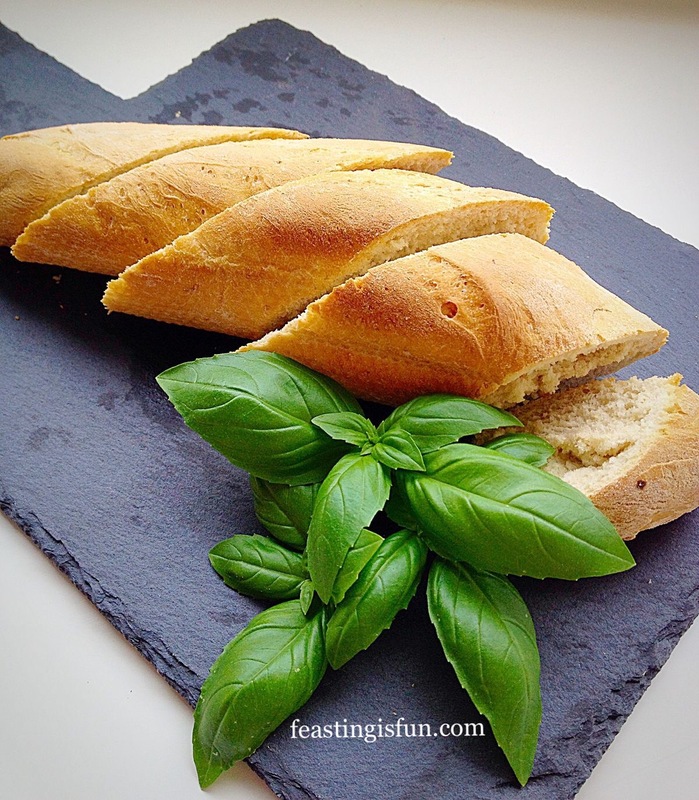 Spicy vegetable, leek and potato are especially good with this bread. It is ideal for dunking! 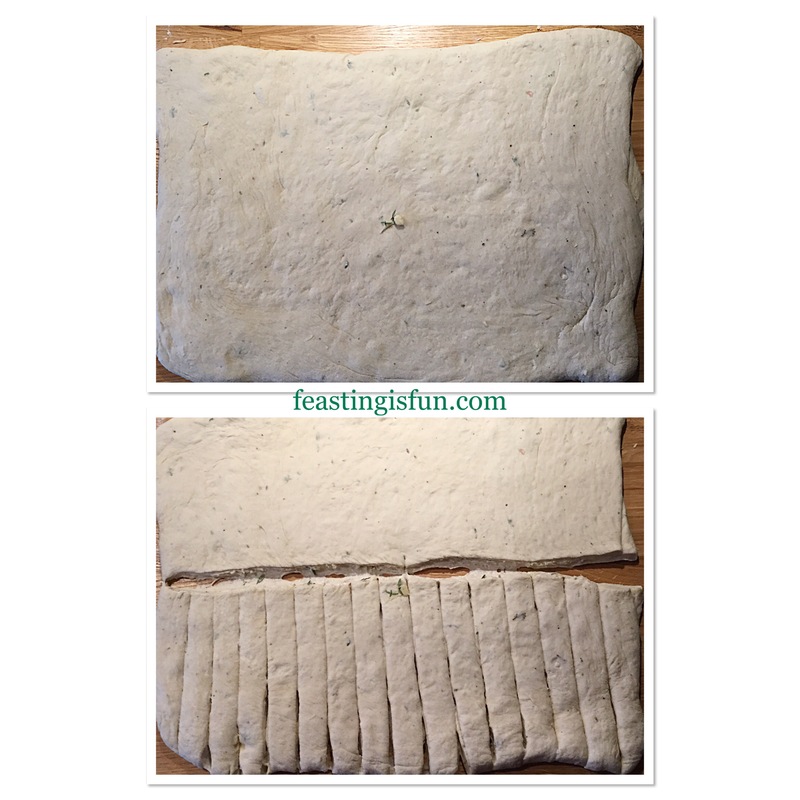 One Garlic Rosemary Focaccia Bread is plenty for our family of five, so I wrap in foil and freeze the other one. 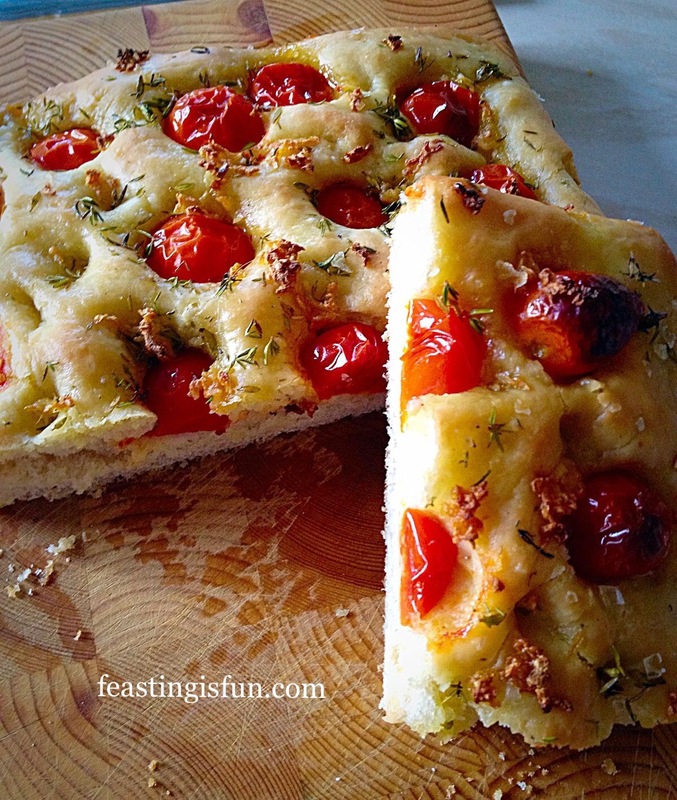 Tomato Thyme Garlic Focaccia Bread. I really hope you give this recipe a try. You can vary the herbs. 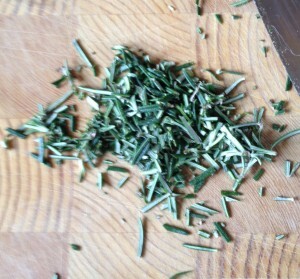 I’ve used Thyme, Oregano and SHOCK/HORROR dried mixed herbs. Ooh I’m such a rebel! But seriously, it works better with the woodier herbs (rather than parsley/fennel) mentioned. Since I find that soft herbs are better mixed with butter and oil, then slathered into a baguette/ciabatta (part bake baguettes work well for this!). Until next time, I hope you have fun giving this recipe a go and enjoy feasting with whoever you share it with. No part of this blog post may be replicated without written permission of the owner. Please see my Disclosure Policy.